Actual Size 20’W x 8’L x 12’H, Minimum setup area needed 25’W x 15’L x 13’H. The Grand Carnival Booth is a colorful carnival game midway that draws the attention of everyone young and old. This multi-purpose unit is perfect for ticket sales, fun food sales, registration, as a game booth and much more. The Grand Carnival Booth can hold up to 8 carnival games plus room on the back wall to display prizes. 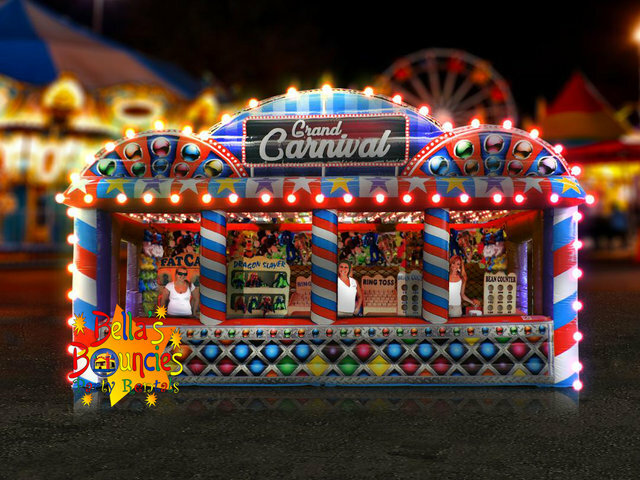 The Grand Carnival Booth can also be equipped with LED lights to add even more pizzazz to your next carnival event! This is a perfect piece for any carnival themed event! Plush toys, Prizes and LED Lighting are available as add-ons.